Kevin, Nualgi doses at 1 ml per 1000 gallons per week. So its 11 ml per week for your pond. If you dont see results, you can add a half dose in the middle of the week to see if it changes the pond biology away from algae. I have an 18,000 gallon pond, NO fish, birds keep killing the fish…..I gave up at trying to prevent the birds from killing the fish, that is ok I enjoy just looking at the water. I dye this water very dark, like the lagoon look. I have long tomato crates for bio filters, don’t use now, no fish. The waterfall to this pond is 12’…pond measures 33′ long 23′ wide…aprox. 3′ deep…string algae!!! This pond is built just like a swimming pool, cement, 3 bottom drains…I want to run JUST the waterfall…again, not using the bio’s, I also have 2 leaf skimmers….If I run JUST the waterfall,….I will get algae, been there done that. I want to enjoy the fall, tired of TRYING to remove the string algae from the fall, can I set a pump in the middle of the pond, spray water into the air to eliminate the build up of the algae, no its not the fall I know but, can’t enjoy the pond because of the algae. We live in the foothills, TREES we cannot cut down..neighbors, those trees are what causes the rotting problem in this pond…..
Judy, string algae on the water fall is one of the harder things to control, especially in the circumstances you describe above. Our customers have reported success using “green clean” algaecide as a spot treatment. If you want more detailed advise, please use this link to provide a little more info about your pond (you can copy and paste the above as well) https://nualgiponds.com/pond-diagnosis-form/. Our troubleshooter will be able to provide a more thorough response. What is the expiration of a 125 ml bottle of Nualgi? Also, is it okay to use in inside home aquariums (a 10 gal tank) . Thank you! Thank you for this great stuff! I don’t use the expensive nuisance UV light anymore. I’ve just done a complete drain and refill of my pond. I filled the pond with rain water from a cistern which I’ve recently come to learn is a very high ph level. Consequently, the string algae is already getting out of control within just a month. What can be done? 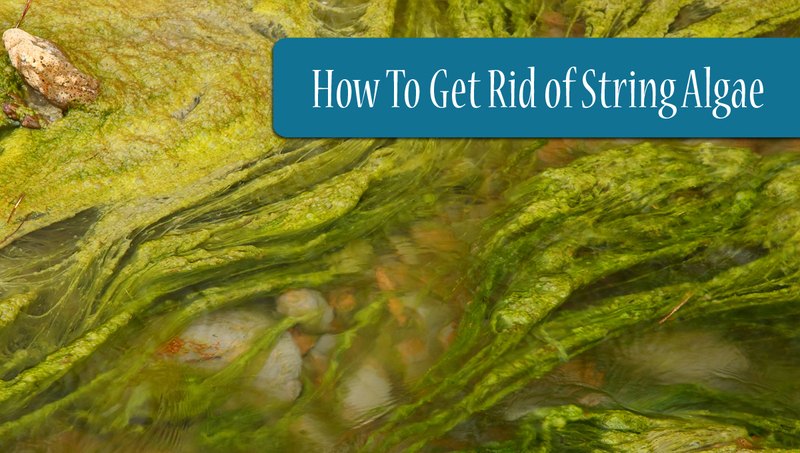 While string algae do not pose a major danger to fish health, those long, messy strings are a nuisance that can ruin the natural beauty of your pond. 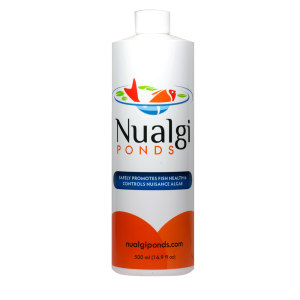 We advise treating string algae with a combination of Nualgi and Beneficial Bacteria. 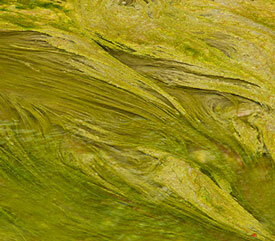 You may have to be patient — it can take up to 16 weeks for the string algae to die out. I have used your product for 3 years now but every winter when the sun can reach the water and all the plants are at the bottom I get string algae. We live in zone 5 so we usually shut our waterfall and filter system down mid to late November. We have 2 aerators which keep a good size open in the pond to release toxins. The pond is 2000 gal and about 3.5 ft deep. Have total of eight 6 to 9 inch koi and 3 orfs. Only feed in summer once every week or 2. Can I continue the Nualgi through the winter with just the aerators going. I also thought about adding some coloring to block the sun since the fish are hidden anyway. Thanks for your question and for being a Nualgi fan. You can continue to use Nualgi during the colder months. There is some dosing information here – https://nualgiponds.com/faqs/how-do-i-dose-nualgi-ponds-in-the-spring-winter/ Shutting filtration down allows for a buildup of ammonia and nitrate because the fish continue with aspiration. Regarding adding pond dye – The good and the bad about pond dye is that on one hand it blocks energy to fuel algae growth, but in spring, it continues to shade diatom growth. A good amount of activated carbon should be used to remove the dye when things begin to warm up, so that the pond biome, which rely on sun energy, can re-establish. Hope this helps and happy ponding!